Unlike the rest of New Zealand, on the West Coast the season for catching whitebait starts on 1 September and the build-up has been noticeable during the last week. 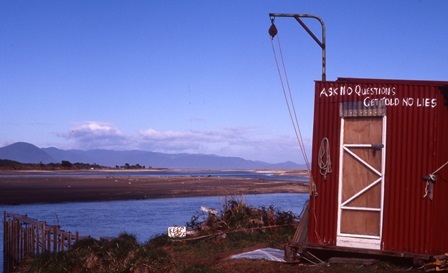 Distinctive huts have appeared along the sides of rivers, motor-homes are noticeably more common and there are more strollers than usual along the river-banks. They are keeping an eye out for shoals of whitebait, a sign that the season will be a good one. Catching whitebait has always been an important part of West Coast life. Tangata whenua had sophisticated and clever ways of catching mata (whitebait), all of which were copied by early Pakeha. Scoop nets, pot nets and trenches (stands) in use today can be easily traced back to the ingenious methods used by Maori. 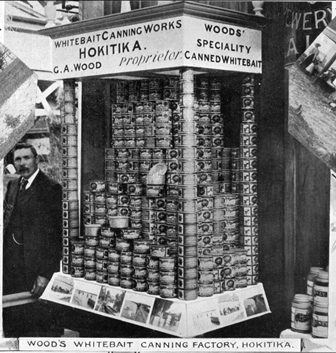 The advent of refrigeration saw a leap in the value of whitebait and the growth of competition. And it seems that wherever people are catching whitebait there are secrets, jealousy and disputes. Secrecy about whitebait catches is one of the most striking aspects of the activity. Whitebaiters are notorious for not telling anyone what they have or haven’t caught – rumours swirl and straight answers are rare. The secrecy is caused by the desire to avoid attracting jealousy about big catches (and the attention of the tax man) or having to admit to poor ones. Those getting really good catches don’t want to broadcast the fact in case others rush to the river. High prices and some great seasons recently have seen an influx of ‘out-siders’ keen to join in the bonanza, but whose lack of knowledge of West Coast whitebaiting ‘rules’ has led to an increasing number of altercations. Newcomers sometimes have difficulty understanding or accepting the local way of doing things. West Coast riverside etiquette has been described as having an ‘almost Jane Austen-like complexity’ with different unspoken rules applying on different rivers or even on the opposite sides of the same river. For example, on the north side of the Taramakau River the rule is that one person will scoop for 50 metres and then pull out, while on the other side there is a continual chain of scoopers with everyone 40 metres apart. For all that though, there’s more to whitebaiting than catching fish. The whitebait season is a time of visits from family and a chance to catch up with friends who whitebait on the same river. Many families on the West Coast have been whitebaiting for generations and the season provides an opportunity to share their passion and knowledge with younger generations. For those who whitebait far from home and stay ‘in camp’ for the season, it is even more of an experience. The huts or baches, the river, friendships and rivalries all make up the fabric of an experience that whitebaiters are reluctant to give up. They might moan about the weather, the sandflies and the lack of whitebait but they will come back year after year because of the intangible specialness of the whole experience. 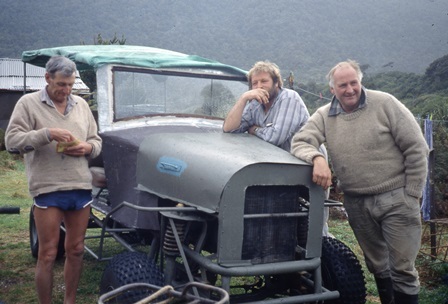 If you want to learn more about the social history of whitebaiting on the West Coast you can visit Hokitika Museum to see their new exhibition on the topic. Julia Bradshaw is the Director of Hokitika Museum. for years our beautiful bait has been convincing northern consumers that the South Island fish is the best, and it certainly was!